These were the words of wisdom bestowed upon us from a friend in San Pancho when we shared that we would be heading to Mexico’s Caribbean. As we’ve recently developed a bit of a hankering for golf cart transportation, it sounded like our kind of place. But as we were bouncing along the unpaved, pot-holed road that would eventually arrive at the ferry terminal, we began to second-guess our travel plans. I mean, we already had plenty of stunning beaches and ocean views to chose from in and around Cancun and the Riviera Maya. Would the two and a half hour trek to Isla Holbox really be worth it? 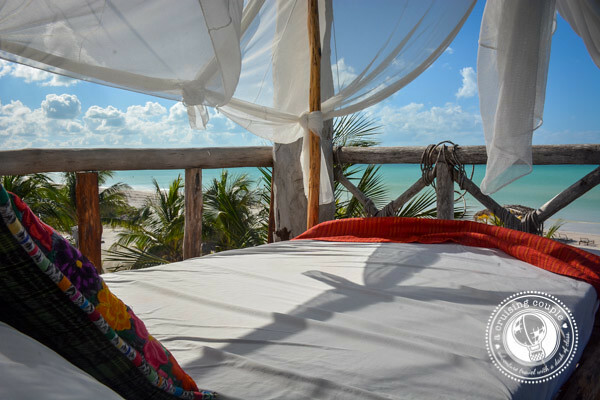 Isla Holbox is pure bliss. And it only took us a about a millisecond to see why. 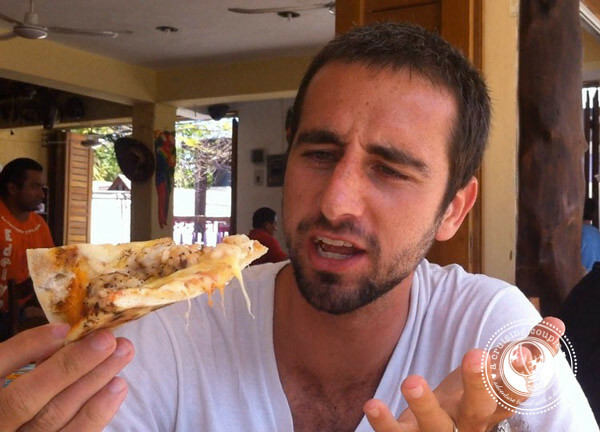 Lobster Pizza is a specialty of Isla Holbox; any local on the Yucatan Peninsula will tell you it’s the one thing you must try when visiting the island. Walking along the small downtown area, we found numerous restaurants advertising a slice of the famed pie. However, it’s said that Edelyn Pizzeria and Restaurante is where you’ll find the original. I don’t know if it’s the best lobster pizza in the world, but it was certainly pretty damn good. The lobster chunks are large, the crust thin, and the cheese plentiful. The buttery taste of the seafood combined with the salty, melted cheese is nothing less than fantastic. It’s quite a rich dish though, and for this reason we struggled to finish one medium pizza between the two of us. 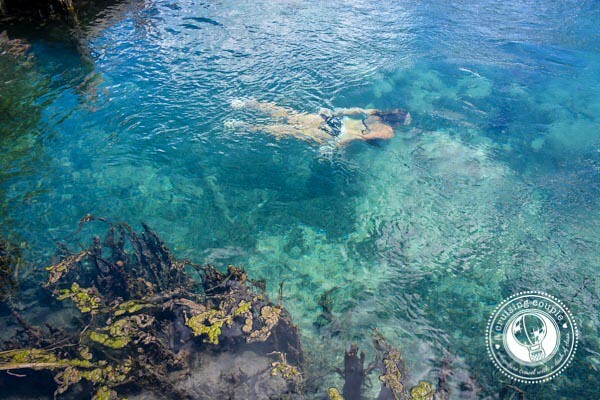 Isla Holbox is perhaps best known for the whale sharks that congregate around the island between June and September; during this time a snorkeling encounter with the world’s biggest fish is almost guaranteed. Swimming with whale sharks is on the top of our never-ending bucket list. But unfortunately our visit to Isla Holbox was in February—completely outside the whale shark timeframe. (Also outside the primary flamingo, dolphin, manatee, and turtle time.) However, we were still able to participate in a beautiful island tour with V.I.P Holbox. 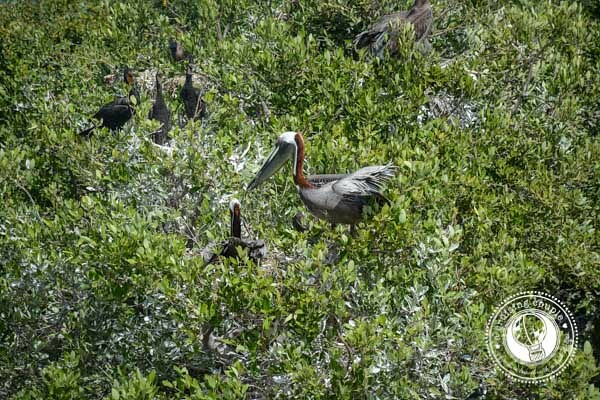 Our half-day tour took us to three different islands with great bird watching opportunities and unique flora and fauna. 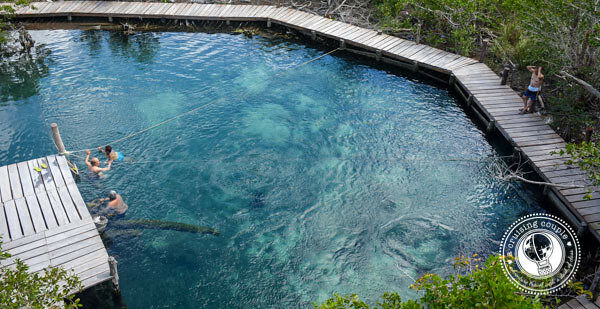 We also went for a dip in the Yalahau Cenote, referred to by the Mayans as the ‘Sacred Fountain of Youth’. It might not be the same as swimming with whale sharks, but it was still an enjoyable way to spend the morning on the water. V.I.P. Holbox was professional and kept the group small, which we really appreciated. They run a large, colorful office in central Holbox where you can also book whale shark tours and fishing excursions. We will definitely be returning to Isla Holbox to swim with whale sharks. We don’t know when, but it’s happening. 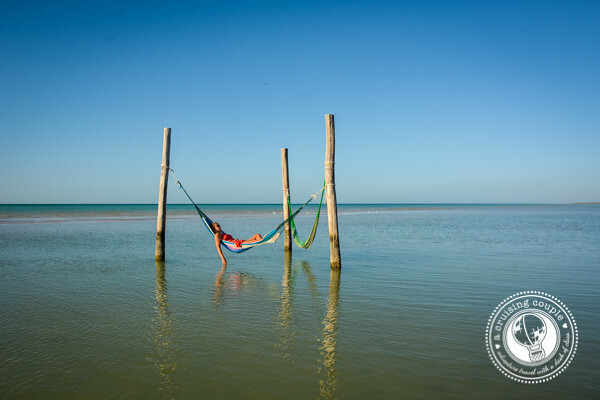 Though Isla Holbox is really just a few hours from Cancun, it feels worlds away. Long sandbars stretch out in the ocean, providing an ideal place to go for a sandy stroll. At night, the sky glitters with hundreds of stars that stretch out continually from all sides. The ocean is calm and inviting, begging those who pass by to go for a dip. It’s completely acceptable to walk around town barefoot. And because the only vehicles on the island are there to deliver goods, there is not nearly as much noise pollution as just about everywhere else in Mexico. 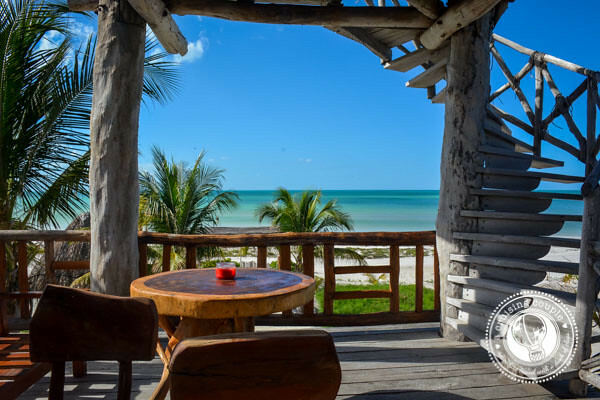 Isla Holbox is where you go if you want to get away from it all. Circumnavigating the island you’ll pass numerous small hotels and beach bungalows. However, none will catch your eye like the stylish Palapas del Sol. This hotelito only has 7 bungalows, promising visitors a personal and intimate experience. We stayed in the beach bungalow with the ‘tower’—a four-story add-on that is likely the tallest structure on the island. We could easily see the other side of Isla Holbox from the top level, though with the gusts of wind we quite preferred to enjoy the view from a bit lower. Our bungalow also had a private outdoor sitting area. This was our favorite spot to enjoy a book on the hammock or utilize the handcrafted wooden furniture as an office. One of the first things we look for in accommodation is a good view; Palapas del Sol certainly fit the bill. The rooms are tropical bungalows, consisting of handmade stucco walls, native wooden structures and traditional palm thatched roofs. During the daytime the natural light illuminates the décor, while at night the low lighting provides the perfect ambience to enjoy the moon and stars. Though the bungalows boast an authentic and natural feel, they still have all the amenities like air-conditioning, private bathroom, private terrace, and WiFi access. 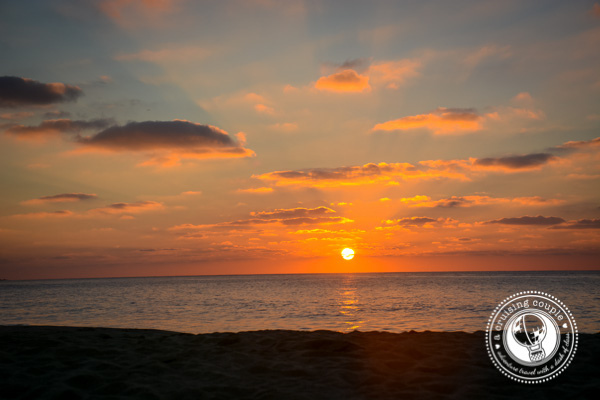 One of our favorite parts about Palapas del Sol is the beautiful and clean strip of beach it sits upon. The hotelito has utilized its space to provide plentiful lounging areas without overcrowding the sand, unlike some of the neighboring bungalows that looked a bit cluttered. And of course we have to mention breakfast. It is a delectable array of both Mexican and Western specialties, cooked to order from the gracious Mayan hosts. We recommend the Mexican omelet. It was very likely one of the best breakfasts we had during our entire two months in Mexico. Need we say more? These hammocks were ingeniously placed in the shallow ocean water. 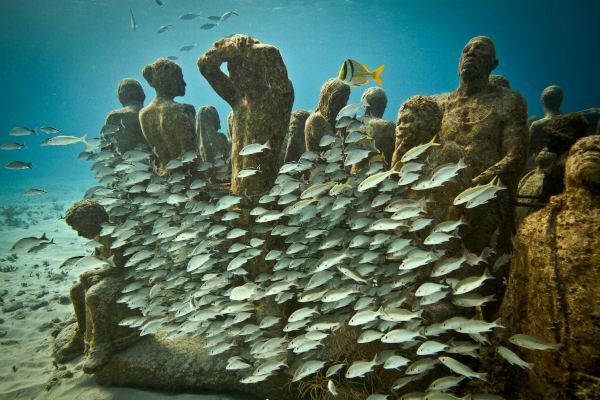 They’re open to the public and located just a few meters down from Palapas del Sol. Seriously, lounging doesn’t get better than this. 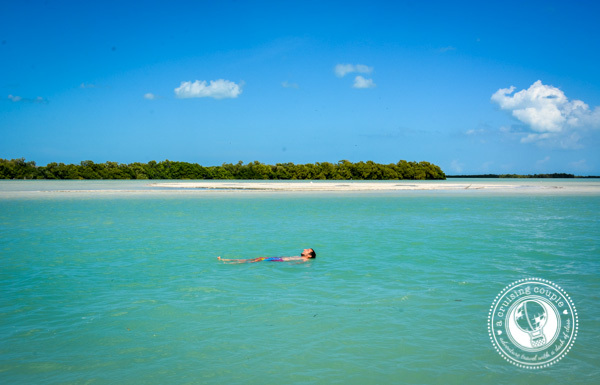 Have you been to Isla Holbox? Which reason to visit sounds the most enticing? A massive thank you to the Cancun Tourism Board for hosting our visit to Isla Holbox. As always, all thoughts and opinions are our own. That looks amazing! I’d love a bite of that pizza. I went to a small beach called Chalacatepec and wrote about it. It’s completely undeveloped and about an hour south of Puerto Vallarta- reminds me of this! Oo wish we would have heard of Chalacatepec when we were in San Pancho! Sounds like it wasn’t too far away from us then! 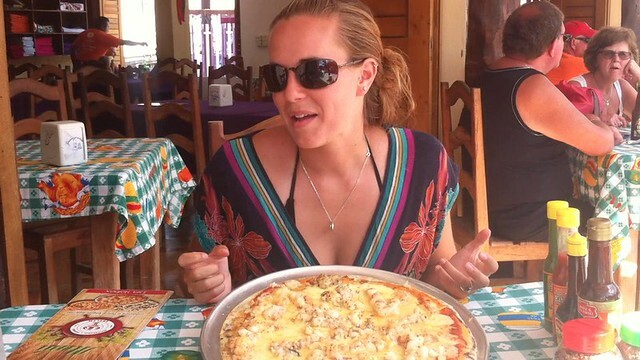 Went to Isla Holbox last year and loved it (also tried the lobster pizza!) I loved the laidback lifestyle and all the golf buggies as modes of transport. Incredible looking place! And that hammock looks like a lush way to wile away an afternoon :) I hope that maybe we’ll get to go to Mexico after Costa Rica.. but Nicaragua also looks awesome. Nicaragua would be so, so nice! We are hoping to have some time to see it in late November/early December. When will you be in Costa Rica again? Sold…I’ll go anywhere for whale sharks and lobster pizza :) Seriously though, this place looks amazing. Off to Google diving possibilities! Rika | Cubicle Throwdown recently posted…Should I Stay or Should I Go? YAY! I hope you find lots of good diving options! I know a lot of people just snorkel with the whale sharks because there are so many of them, but diving would be amazing! Now it’s on top of my must-go places!! And lobster pizza???? Seriously??? WOW!! Love Isla Holbox! We were there two years ago to swim with the whale sharks and the trek to get up there is so worth it! would go back again anytime! Ahhh so jealous you got to swim with whale sharks! It sounds amazing! I’ve always got a hankering for pizza so I’d jump at the lobster pizza for sure, though the kids might pass it by. You’ve got gorgeous pics of the beaches and turquoise waters. We have the Yucatan eventually in our travel plans and this is making me want it faster!! I should just hop in the van and go (not so easy). Haha yes, just go!! 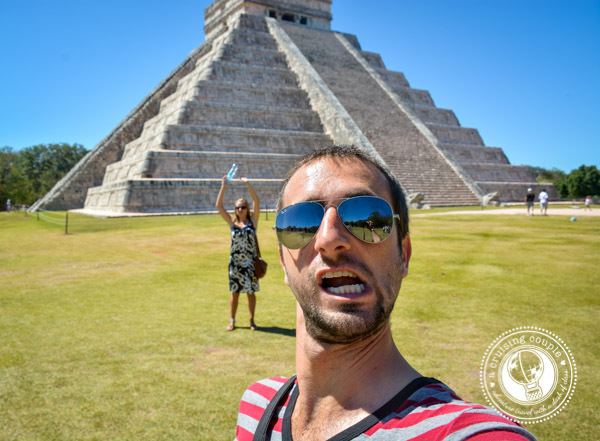 :) I hope you make it to the Yucatan soon- it’s an amazing place! Isla Holbox sounds like a great place to visit. Will keep in it mind on our future travels! It’s amazing! Hope you love it as much as we did if you make it there! You had me at lobster pizza! Now why didn’t we think of that! Definitely the best combination of the two! OK, sold. It’s on our list! YES! You always need an excuse to return to a place, anyway! If you do go, definitely try to make it there during whale shark season. I think it would be amazing! Looks amazing, and it has mangroves…I guess that makes it mangroovy ;-) Thanks for sharing. Haha great adjective! Yes, it was beautiful! I love the hammocks and the beach view from the bungalow. That is an incredible location for some r + r.
We actually haven’t heard of Putin Bay! Sounds great as well though. 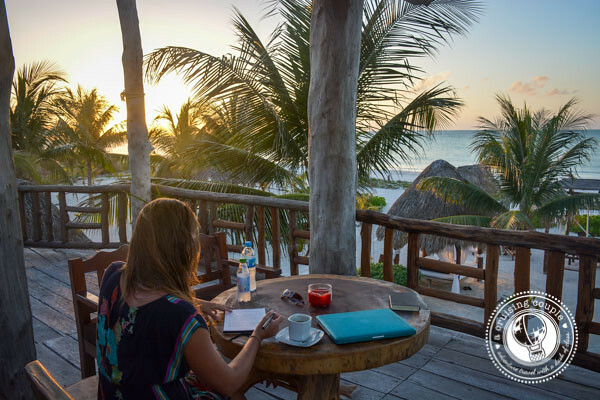 And Palapas del Sol definitely tops our list of awesome ‘offices’ we’ve had! It’s in Ohio and is a very popular touristy place. Easy access from Port Clinton. I think it is across Lake Erie. We’re staying at Palapas del Sol in October. I totally can’t wait. I’ve heard a lot about mosquitoes. Did you have any problems when you were there? That looks pretty sweet! Definitely adding it to my list! Probably towards the end of my trip, after soaking up all the adventure spots. Thanks for sharing! That`s an amazing article. This reminds me of island of San Andres in Colombia. It`s a paradise. I went with my family last year the place its wort it, we arrenged before hand to be pick up at cancun´s airport and be taken to our hotel in holbox with Holbox Travel, they include us the ferry tickets and the cap from the dock to our hotel Las Nubes, the hotel was one of the last in the hotel zone really peaceful and beutiful, we also took two tours with Holbox Travel, the whaleshark tour and the clasic tour, both were really fantastic but the whaleshark one was one of the best things i have ever done,i couldnt keep up with them but what a thrill, really worth it. I leave the link of the company i did the tours with higly recomended.